The one thing you notice the most about being an international student is how patriotic you become after studying overseas. Missing your friends and family that made your country home is one thing. You keep in touch. It’s not so difficult to Skype during the weekends when the time differences are easier to work around. Missing the country for its sights and its foods is another. You miss it so much so that you will happily pay four times more for Singaporean food at a restaurant in Chicago that’s 45 minutes away from campus. You miss it so much that you will dine at Chinatown every time you get a chance to go out to eat. You miss it so much you try to recreate the foods you used to get at the hawker centres, but you never manage to get it quite right. You miss it so much you plan a three-day food and sights tour of Singapore, so you have an excuse to go about the country rediscovering all the best it has to offer. Often taken with soft-cooked eggs and coffee, kaya toast is an iconic Singaporean/Malaysian breakfast food. Fragrant kaya spread (a sweet brownish paste made of pandan, egg, and coconut) is layered on with a slab of butter that melts under the warmth of the delightfully crispy toast. It makes for the perfect sweet beginning to your Singaporean journey. There are several Singaporean chains that serve kaya toast, including the famous Ya Kun Kaya Toast. My personal favourite is Toast Box, which I believe uses the best bread (thick, chewy, with the option of white or multi-grain). 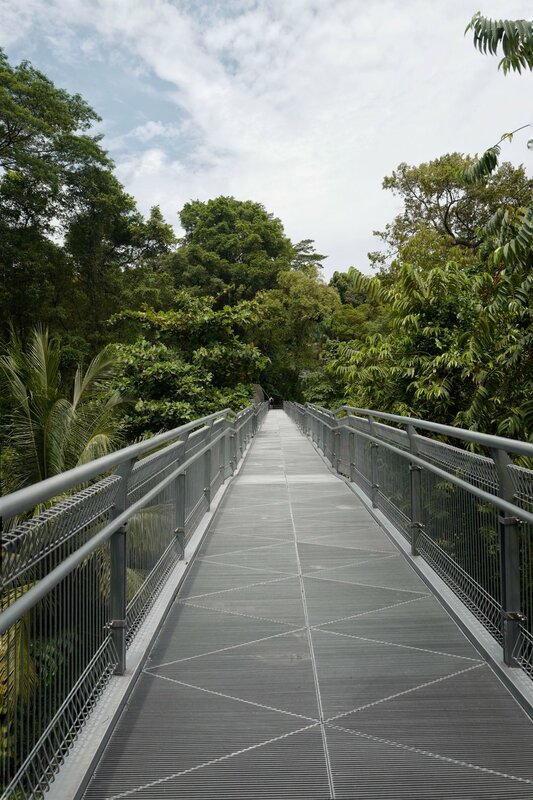 The Southern Ridges is a collection of trails that takes you through parks, hills, and forests, often on bridges built amongst the treetops. Henderson Waves, the highest pedestrian bridge in Singapore, is my favourite trail for its beautiful, curving architecture, and its views of the island. It is especially charming at night, when the bridge is illuminated by soft, orange lights. Just a bus away from the Southern Ridges is the famous Queensway Shopping Centre -- a popular spot for locals looking to get discounted sportswear. It is also a popular spot to have a favourite Peranakan dish, Nonya Laksa: a spicy rice noodle soup served with seafood. There are many variants of laksa across Southeast Asia, but Nonya Laksa is made rich with a lot of coconut milk. I recommend having laksa with otah, a spicy fishcake. The laksa stores at Queensway serve up another gem -- chicken curry. This is done Nonya-style, rich in coconut milk like the laksa. Like the laksa, it is spectacular. The word “nightmare” is often spoken in the same sentence as Haw Par Villa. Follow the sign board pointing you to the Ten Courts of Hell and you’ll find the exhibit that this park is probably most famous for: a set of dioramas explaining the journey that souls take in the Taoist afterlife, including the different forms of punishments that are inflicted upon them in accordance to the sins they’ve committed while they were alive. A relatively tame example: People having their tongues pulled out for the sin of spreading rumours. 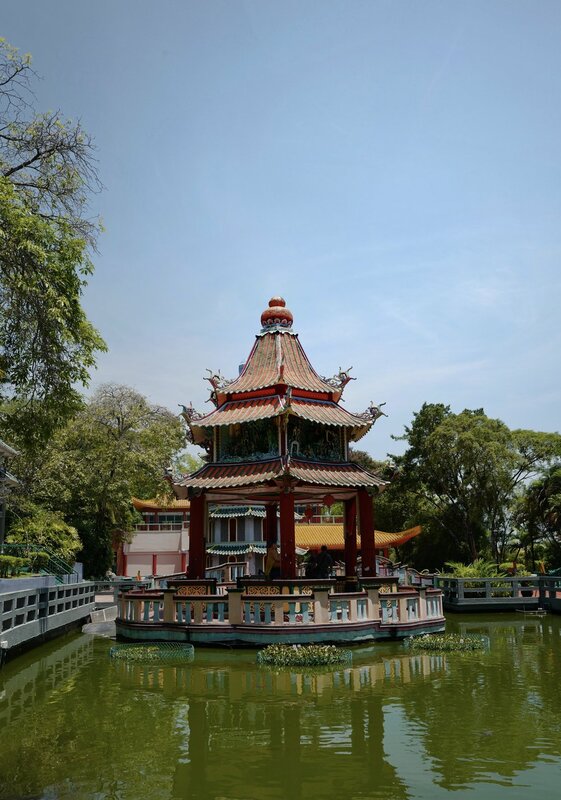 Thankfully there is more to Haw Par Villa than just this -- statues and dioramas depicting Chinese folklore, including scenes from Journey to the West and Madame White Snake. 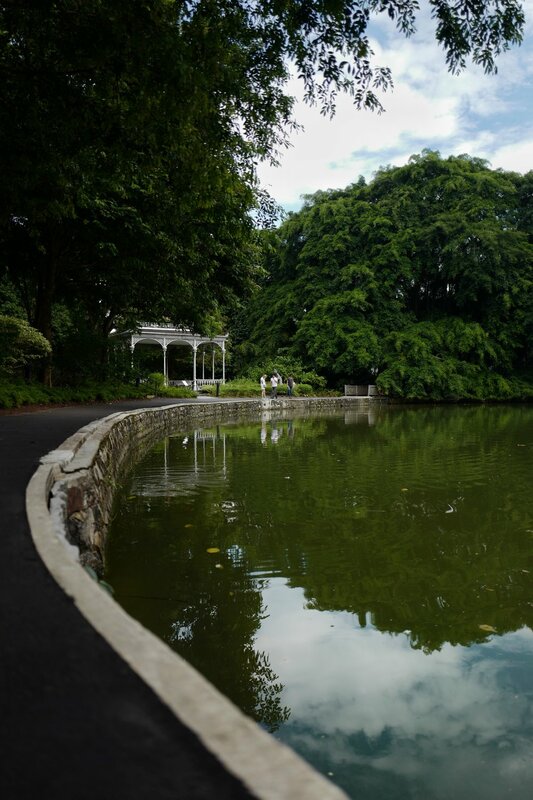 The Botanic Gardens is a favourite spot for families on the weekends. It is also Singapore’s first UNESCO World Heritage Site, and the only tropical botanic garden on the UNESCO’s World Heritage list. If you visit, don’t miss the National Orchid Garden, home to 1000 species and 2000 hybrids of orchids. Chili crab is a classic Singaporean favourite. Served in a deep pool of thick, sweet and spicy tomato-chili sauce, chili crab is typically ordered with fried or steamed buns for dipping. 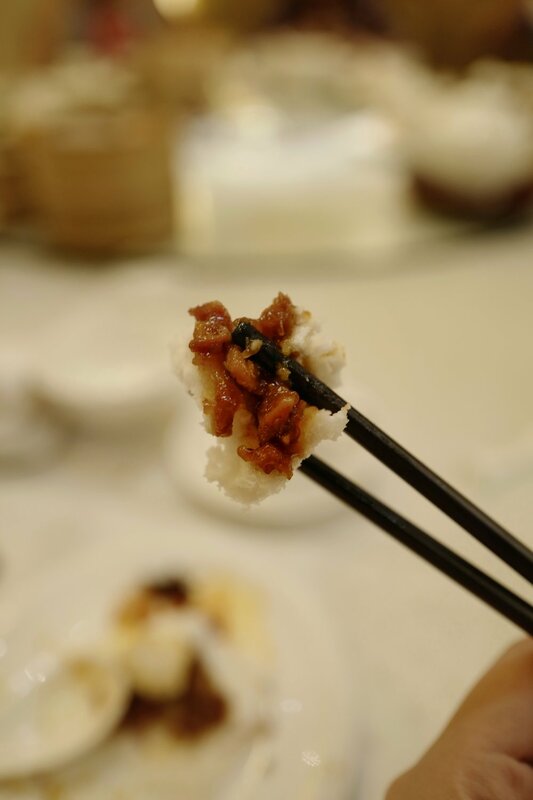 Today, the dish is served in most Chinese seafood restaurants, such as the JUMBO Seafood and Long Beach Seafood chains. 8. Order Black Pepper Crab too! 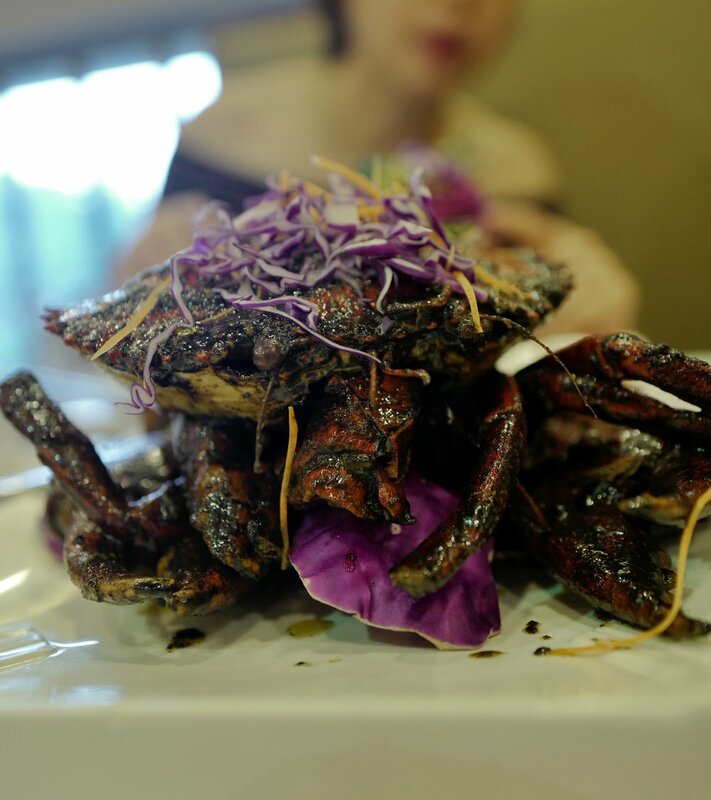 If you like crab but prefer something more savoury, order the black pepper crab. This crab is fried with black pepper to create a fiery, mouth-watering layer of butter and pepper around the crab shell. Clarke Quay is clubbing central. Set on the two banks of the Singapore river, Clarke Quay is also simply gorgeous. The Cantonese community is Singapore’s third-largest Chinese dialect group, making up about 15% of Singapore’s Chinese population. It is no wonder then that there are so many amazing dimsum spots on the island. Some of my favourite spots include Lei Garden -- which was awarded a Michelin star in 2016 and 2017 -- and Imperial Treasure Cantonese Cuisine -- which, yes, is in fact part of the same restaurant group as Chicago’s Imperial Lamian. Bring lots of friends, because you’re going to want to try everything. For a modern take on the traditional dimsum dishes, try the dimsum buffet at Empress, located along the Singapore river. The dishes there are beautifully made and delicious. Orchard Road is the Magnificent Mile of Singapore. Along the 2.2km stretch of central Singapore, there are more than 20 different malls, each filled with various local and international stores, as well as a whole bunch of restaurants and small food stores. Few dishes burst with flavour the way good Indian food does. This chicken masala, one of the banana rice dishes at Banana Leaf Apolo, was coated in a rich sauce just spicy enough that I could enjoy the heat while still enjoying its full flavour. The accompanying serving of biryani was generous, and tasted of a wonderful blend of spices. And, if somehow the food was not enough for you, you can ask for more rice and vegetables for no additional cost. 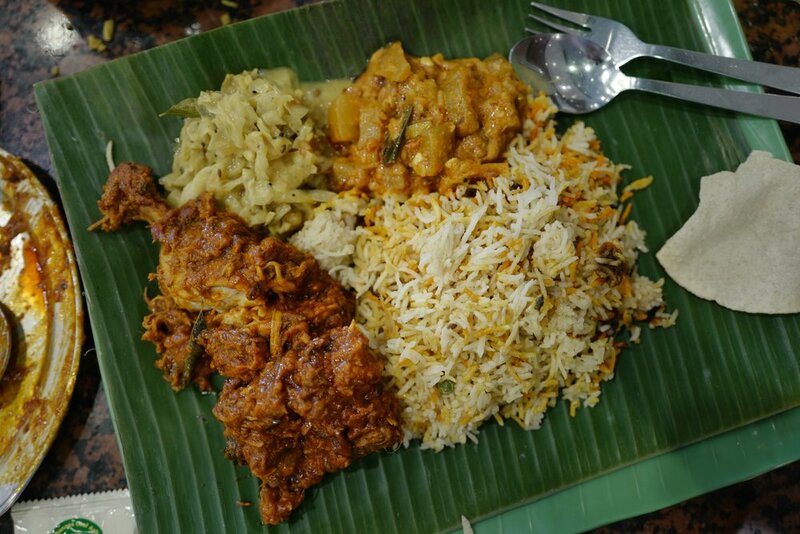 The Banana Leaf Apolo is a popular choice amongst the many restaurants serving banana leaf rice in Little India, as its air conditioning makes for the perfect break from the Singapore heat. But, if you can do without the air conditioning, try Gayatri Restaurant. Walk off your gigantic food baby by exploring the many colourful and beautiful sights in Little India. From the thousands of gorgeous saris hung up in Tekka Centre, to the row of stalls along Little India Arcade, to the intricate, multi-coloured facade of the Sri Veeramakaliamman Temple, Little India proves every time to be one of the most interesting cultural spots in Singapore. Take just three train stops away from Little India and you’ll find yourself in Chinatown. The area is mostly known for its many brilliant Chinese restaurants, such as those on Chinatown Food Street, but it also features the spectacular Buddha Tooth Relic Temple and rows of adorable Peranakan shop houses. What are hawker centers? They’re basically like food courts in the US, except way better. We can say that because two of our hawker stalls have won Michelin stars. Today you can have a Michelin-star meal at a record low of USD1.42 (chicken rice at Liao Fan Hong Kong Soya Sauce Chicken Rice & Noodle). Hawker centers are cornerstones of the Singaporean experience. In fact, we have decided that they were so quintessentially Singaporean and so unique to our country that we are bidding for Singapore’s hakwer culture to join the UNESCO’s List of Intangible Cultural Heritage of Humanity. Lau Pa Sat is probably one of the nicest hawker centers you’ll find in the country. It is also one of the most iconic. Yet, despite being poised for touristiness, Lau Pa Sat is actually home to a ton of great food. Take for example the char kway teow at Lai Heng Fried Kway Teow. This char kway teow is done Singapore-style. The Singaporean char kway teow is fried with a sweet dark sauce, unlike the Penang char kway teow, which is made with a chili paste. If you’d like a mix of spicy with your Singaporean char kway teow, don’t forget to ask for a side of chili. I think the added chili makes a world of difference. Yong Tau Foo is one of the healthier foods you can order in a hawker center (although there are many ways that you can make it unhealthy again). 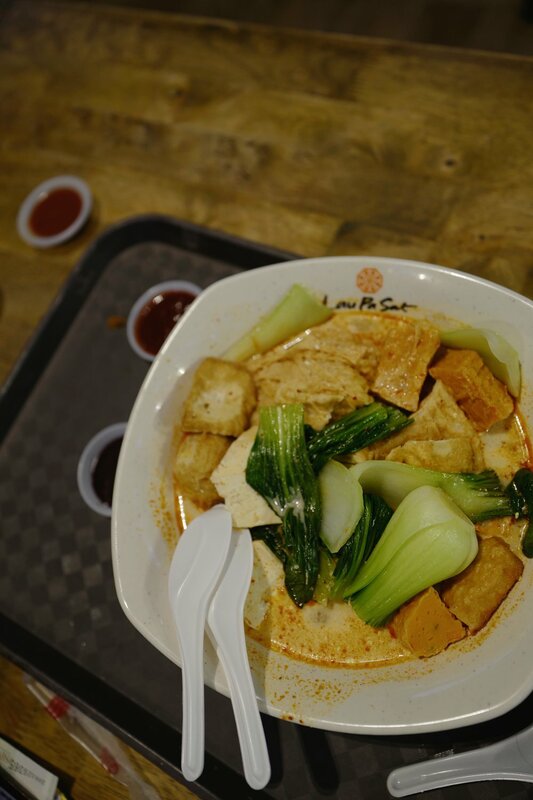 At a Yong Tau Foo store, you are typically given a bowl and a pair of tongs, and you pick from a huge display of different vegetables, and more importantly, different types of tofu filled with ground meat or fish. Then, you pick a soup and noodles (optional). The Hakka dialect group’s Yong Tau Foo traditionally serves their Yong Tau Foo with brown sweet bean sauce, but many stalls let you choose from a clear soup -- for when you want something cleaner and healthier -- and a laksa broth -- for those that want something richer. Loy Kee Yong Tau Foo at Lau Pa Sat will also re-fry the ingredients for you if you ask. Lau Pa Sat is located in the central business district of Singapore, which is enclosed by the marina. Walk from Lau Pa Sat to the cross-section between Marina Boulevard and Collyer Quay. From there, you can follow the path north and take yourself through stunning nighttime views of downtown Singapore on the viewing point on the rooftop of 1-Pavillion, to the famous Merlion statue where you can sit by the stairs watch the twice-nightly light shows, to the famous Esplanade performance theatre, to the Singapore river, where a band plays every night at the Timbre at the Arts House. Hainanese chicken rice is easily one of the most likeable dishes in the country. Made either roasted or steamed, the chicken is served with rice that it has been cooked with. This makes the rice is so flavourful you could eat it on its own. Chicken rice is served with three sauces on the side, dark soya sauce, ginger and spring onion sauce, and, my favourite -- chili sauce. Chicken rice stalls usually make their own chili sauce, and can make a huge difference to their dish with just that. The sauce is often quite spicy, but I believe it has to be taken with the food. 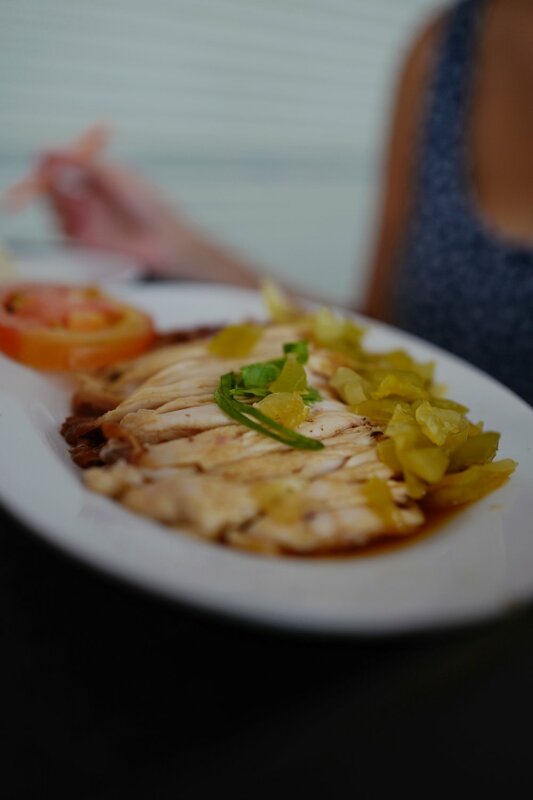 As with many dishes, Singaporeans are very opinionated and often incredibly defensive when they are asked where the best chicken rice in Singapore is. Some famous favourites include Tian Tian Hainanese Chicken Rice at Maxwell Food Center, and Boon Tong Kee, which is a restaurant chain. My person favourite, Pin Xiang Chicken Rice, is nestled in a busy neighbourhood hawker center in the east side of Singapore. While this means that it probably isn’t going to be convenient for tourists, if you’re crazy enough about food it could make sense to drop by when coming to or from the airport. The hawker center is just next to Bedok MRT, which is just three train stops from the airport. Ice kacang is found in a number of Southeast Asian countries, and in each one they’re made a little differently. In Singapore, ice kacang has two essential parts -- the flavoured shaved ice, and the jelly and bean mix base. 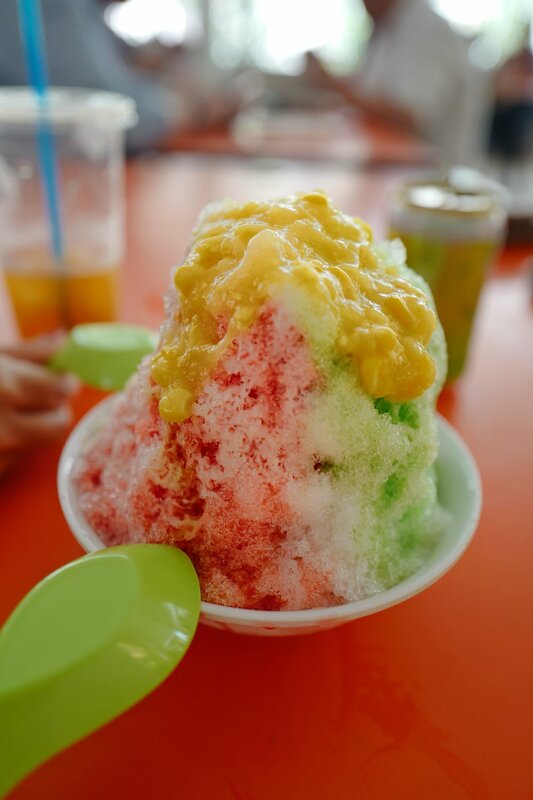 The shaved iced is divided into three parts, one part drizzled with rose syrup, one with pandan, one with gula melaka (a type of palm sugar). Finally, the iced mountain is topped with sweet corn. At the bottom of the dessert is, typically, a delicious mix of red beans, grass jelly, sago, and attap seeds -- hence its name, which literally translates from Malay to “bean ice”. Gardens by the Bay quite perfectly encapsulates all that Singapore’s city planners want the country to be. The park features a mix of gorgeous, ultra-modern structures, entangled in an incredible variety of flora. The Gardens by the Bay is probably Singapore’s most visited attraction, and with good reason. My favourite attractions are the Cloud Forest (home to the hotty instagram’d indoor waterfall) and the OCBC Skyway, (which takes you on a beautiful aerial walk around the iconic Supertrees) but if you have time, I highly recommend taking the time to visit all of the park. Even if you’ve never heard of Marina Bay Sands, it’s likely you’ve seen pictures taken from it. The rooftop infinity pool, which sits on the of 57th floor the hotel, makes for a super cool photo spot. While only hotel guests have access to the pool, there are several rooftop bars and restaurants, such as Ce La Vie and Spago, which feature the same, breathtaking views of Singapore. Marina Bay Sands also houses a giant mall known as The Shoppes. It’s got a lot of amazing restaurants, like CUT by Wolfgang Puck, which was awarded a Michelin Star in 2016. As the unofficial luxury-good central of Singapore, it’s also the best place to go to witness real life crazy rich Asians on the prowl around its 170 premium brand stores, and 15 duplex and triplex luxury stores. Located right outside the main Marina Bay Sands building, the ArtScience Museum hosts a range of different exhibitions in the arts and sciences (obviously). The Future World, which features a collection of interactive, tech-enabled artworks, is a popular one. Sentosa has got a casino, a Universal Studios amusement park, a water park, a butterfly park, a gravity ride known as “the Luge”, a Madame Tussauds, cable car rides, and three beaches. Get ready to get exhausted. Of all the major Chinese restaurant chains, Putien is probably my favourite. The Fujianese restaurant has been getting increasingly popular lately, especially after its branch in Kitchener Road was awarded a Michelin star in 2016. Each time I visit I always order the heng hwa bee hoon. It is probably the best bee hoon you will ever have. The noodles are moist, springy, and filled with flavour. There’s a slight char taste that keeps it all interesting. Perhaps most importantly, the noodles go beautifully with Putien’s homemade sweet and sour chili sauce. When you visit, don’t miss out on the stir-fried yam, the shredded pork, and the pig trotters. If you have time and aren’t afraid of Singapore’s afternoon sun, a trip to the Singapore Zoo or the neighbouring River Safari is highly recommended. Not a lot of people know this, but the Singapore Zoo has been many a time recognised as one of the best zoos in the world. But if you’re not willing to sweat it out, visiting the Night Safari, the world’s first nocturnal zoo and home to over 130 species, will make for a unique way to spend your evening.